Have you tried asking God for big things in your life? Pray with boldness and see God work in your life. How has your prayer life been lately? A little lackluster, maybe? Yeah, mine too. 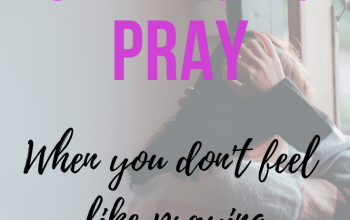 While I make it an effort to sit in silence and connect with the presence of the Holy Spirit within me, there have been days when I’m too busy or too distracted to pray. I may offer up a simple “thank you for this day” kind of prayer or a “God please let everyone be in a good mood when I get home” (ha! ), I do not give myself the space to really soak in God’s goodness and listen to His prompting. So yeah, my prayer life has a bit lacking to say the least. My son recently celebrated his 10th birthday (yay for double digits) and one of his gifts was the Action Bible. He loves comic books so we thought he would enjoy this as well. As I was flipping through it myself I was awed by the drawings and saw such a visual display of God’s amazing power in each story. I happen to turn to the story of Moses leading the Israelites out of Egypt and being faced with the Red Sea in front of them and Pharaoh’s army behind them. They were trapped. This massive body of water was swelling, roaring, and as wide as it was deep. Yet they were told that God would make a way for them to cross and boy did He ever! He parted the sea so His people could pass. Wow I thought, what a mighty God! What a powerful God! I knew this, yet I had somehow forgotten it. And that same God who did that is the God that we pray to each day. We are told that He is the same, today, tomorrow and forever. He never changes. He is not only the source of all power, but He is power itself! And that power is limitless, boundless and overflowing. The reminder took my breath away and put a smile on my face at the same time! This same God is the God who loves you and me. Who knows us better than we know ourselves. He has the power, the might and the grace to remove any obstacles that are in your way. So let us pray with boldness and with faith that what we ask, if it be His will, will be given to us. Let’s not pray for small blessings only – those are great too – but instead I want to remind you, and me too, to pray for big things. To pray boldly means we have established a relationship with God. You wouldn’t go to someone you just met or don’t know too well and say ‘that thing you’re giving me is good and all, but can I have a little extra.‘ It sounds so greedy and completely one-sided. 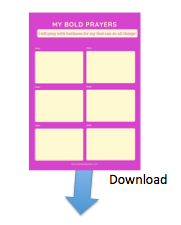 So the first step to setting yourself up for praying with boldness is to spend time with God. He already knows all about you, so get to know Him. Pray daily, talk to Him throughout your day, visualize His radiance surrounding you. Be kind and give to others and keep His commands. Then, when you and Him are BFFs and you can feel His presence around you, then you are ready. Instead of just: God please change my husband to be the person I once love. Bold prayer: Father, please heal my marriage and bring so much love and joy between my husband and I that nothing can come between us. 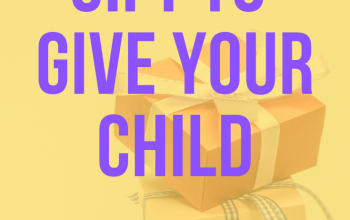 Instead of just: God help me to do well in my vocation as a mom or my job. 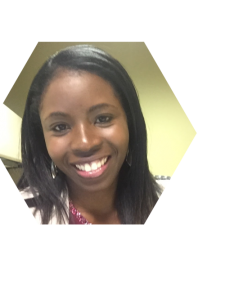 Bold prayer: God help me to not only do my job (as a mom, wife etc) well, but let me do so well that it surprises even me! I want to be the mother you want me to be. Instead of just: God please let this headache go away and give me more energy. Bold prayer: God please heal my body, my mind and my spirit. Make me so strong and healthy that those who see me will wonder in amazement at my transformation. And when God answers your bold prayers, don’t hesitate to give Him the glory. Shout it from the rooftops – or in today’s world, post it on all your social medial platforms – so that everyone knows of the goodness, power and might of the God that you and I are serve. Our “Daddy” loves us so much. He wants to bless us and give us all we are searching for. Knock, with resolution that His blessings will be opened to us. Your God is waiting to hear your prayers. 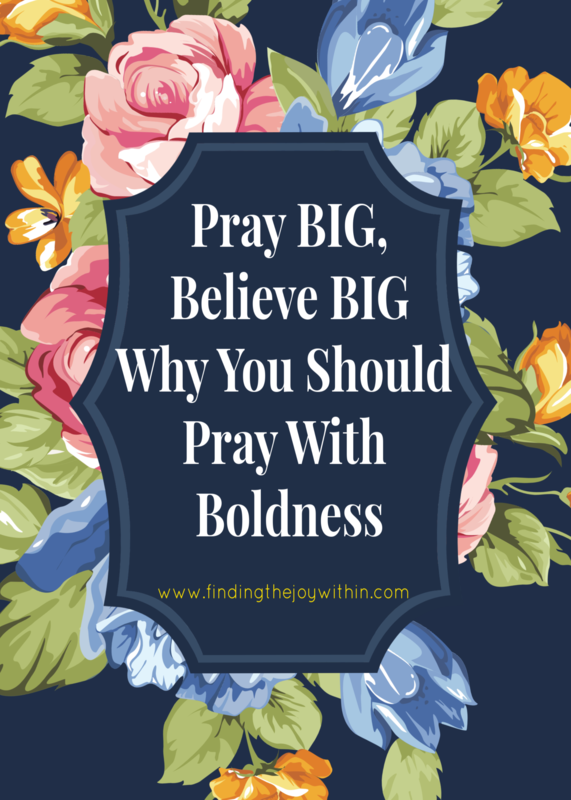 Will you join me in praying with boldness today?